SUMMER SEASON SAVINGS SPECIAL! SAVE on OBSESSION, the Hatteras 85 with Petra & Arno aboard! 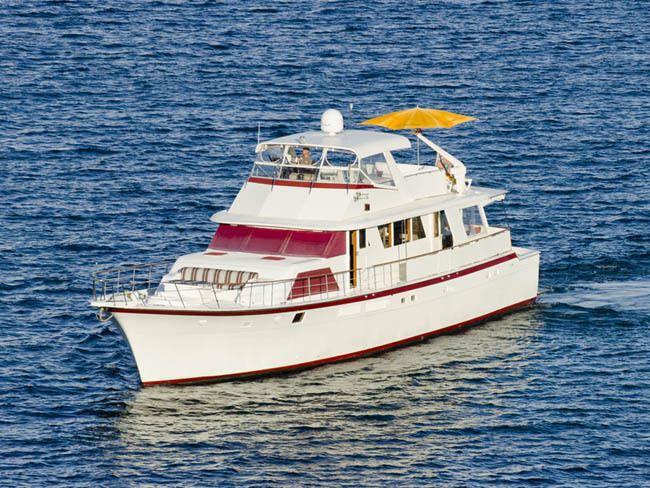 SAVE on OBSESSION, the Hatteras 85 with Petra & Arno aboard! These are the hallmarks of motoryacht OBSESSION, a Hatteras 85 cockpit power yacht. Veteran crew team Arno and Petra Hess bring their years of knowledge and skills to one of the most reputable motoryachts chartering in the islands. join Arno and Petra in the Virgin Islands or the St. Martin/St. Barths areas for the yachting vacation of your dreams. bathroom with stall shower is down 3 stairs, off the common hallway. bed, and ensuite bathroom with stall shower. Green bedspreads. beds, also with ensuite bathroom. .
5. In common main salon, new leather sofa has a full size pull-out bed.